Last week the National Greyhound Association (NGA) came out in favor of "ag gag" bills, proposals that have been introduced in several states to criminally charge whistleblowers who record evidence of animal cruelty. 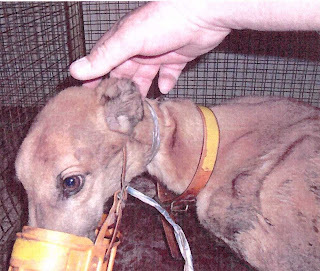 In doing so, the group not only launched a bizarre attack on greyhound advocates, but also sided with extreme factory farm interests and animal abusers. "This bill is about protecting animal abusers." In its statement, the NGA also made various false claims about our cruelty reporting policies, and told people to tell them about incidents of greyhound abuse rather than contact law enforcement authorities. The fact is, GREY2K USA has a very clear policy of forwarding credible complaints of greyhound cruelty to state regulatory agencies. A few examples of such reports can be found here, here and here. Meanwhile, we have obtained thousands of state investigative files through public information requests, and have found virtually no evidence of the NGA, or its public relations arm the so-called "American Greyhound Council," providing regulators with information about greyhound abuse. That is apparently why the NGA wants the public to contact it first, so it can ensure that greyhound cruelty cases are covered up rather than reported. Of course, this shouldn't surprise anyone. After all, this is the same organization that has opposed efforts to report greyhound injuries to the public. It also refused to take action against greyhound trainer Ursula O'Donnell, who was accused of participating in a conspiracy that resulted in the death of thousands of greyhounds. Similarly, no action was apparently taken against former NGA President Dutch Koerner after he admitted hiding ownership in a dog track kennel and working with another man to falsely certify dogs. Koerner continued working in the dog racing industry for years after this incident, and was even given the NGA's first-ever Lifetime Achievement Award. Incredibly, when Koerner passed away earlier this year NGA Executive Secretary Gary Guccione praised him as a "strong advocate for holding greyhound owners and kennel operators accountable." Apparently this accountability did not apply to Koener himself. After looking at the record again, the NGA's support of "ag-gag" bills makes perfect sense. Their job isn't to protect greyhounds. Instead, its focus is protecting the dog racing industry at all costs. Greyhound racing needs to be banned in the US, as well as in every other country on the planet. It's horrendous the way these poor dogs are treated like so much garbage. These abusers should be locked up forever and receive the exact same treatment that they give these poor dogs. In fact, they deserve to be treated far worse. The best thing we can do is to simply continue working hard for the dogs. Carey, Christine, and any number of Grey advocates around the world have seen this letter at various times in this ongoing debate. I have continuously used it to counter claims of how "safe" Grey racing is, or how much "Greyhounds love to run" (with the unsaid inference being "at the tracks."). I encourage all Grey lovers to copy it for themselves, and to keep it as an "arrow in their quiver" to combat the lies told by racing supporters. You are encouraged to make it your own, especially changing the signature, and to modify it as needed. All I demand is that you are completely truthful. I have copied a list of only the links (sometimes with brief descriptions of some of the clips), and will use them if there is limited space, or the links only options will serve the argument better. If I see an argument or article regarding Grey racing, I try to post this as quick as possible so that newcomers to the conversation will the the damage done by the racing industry first, before racing supporters barge in and start calling everyone who opposes grey racing liars. I have to post this in two parts. Ignoring all of the evidence proving that Greys suffer in innumerable ways at racetracks does not make any of it go away, from malnourishment (including feeding them 4D meat (the meat from dying and "downer" cows)), to debilitating injuries, to premature deaths. If ANYONE believes the Grey racing proponents here, or anywhere else, venture forth. Just a few, minimal examples are right here. Of course, these don't fit the Greyhound Racing Association's talking points, do they? Just so everyone reading this knows the malice and ill-will cavalierly thrown about by these imposters who pretend that track racing is good for Greys, let's have a look at these vids and articles, and then see who the liars REALLY are, shall we? You can go online and find innumerable videos and articles on the abuse on Greyhounds at the tracks, and the thousands of Greys bred to produce a few hundred “acceptable” (read: money-making) racers. Search “Greyhound death”, “Greyhound abuse”, Greyhound torture”, “Greyhound fatality”, “Greyhound fatalities”, “Greyhound disaster”, “Greyhound accident at track”, or many more combos. And it only gets worse from there. So, EVERY TIME someone tells you how “innocent” Grey racing is, or how much “Greyhounds love to run,” ask them, “How much do Greyhounds love to run at racetracks?” Ask them “How much did the white Grey with the blue coat looking right (at the rear of the pack at 1:26 of this clip from GreytExploitations.com) love hearing a racemate scream in agony, before watching it snap its neck? http://www.youtube.com/watch?v=ayrI5OTOkjw&feature=youtu.be Here, they are indoctrinating kids into this brutal industry. (This portion is regarding the racing industry's propoganda (lies) that Grey2KUSA.org actually makes up the numbers used to report on deaths and injuries at Grey racetracks. We are speaking directly to the racing industry, as they are keen to make up lies to make their immoral industry more palatable to moral and conscientious people.) As for Grey2KUSA.org, they ACTUALLY get the numbers directly from the tracks themselves when tracks report them to the states, as required by law in some states. So, Grey2KUSA.org’s numbers are as far from made up as your claims of the innocence of Grey racing is from the truth. As you said (as a racing supporter), when someone (you) gets their numbers from a skewed source... Do you Grey racing supporters EVER read this stuff through before posting it? My word, Swiss cheese can only DREAM of having so many holes! 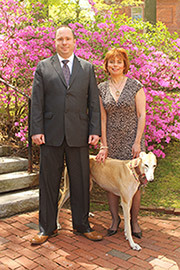 As for Greyhound Pets, Inc., I feel they are a great group. They have wonderful things for one particular Grey who holds the most special place in my heart. However, they are "neutral" on racing in a Faustian Bargain, because most tracks REFUSE TO ADOPT OUT TO GROUPS WHO OPENLY OPPOSE GREY RACING! Therefore, no matter how vile they find racing (and they DO find it vile! ), they agree to not speak ill of the tracks because the tracks will then go back to killing ALL the Greys, instead of adopting some out. A Faustian Bargain, definitely, but it saves thousands of Greys from the horrible deaths you otherwise give them. I have to ask, do you tear their ears off before or after you murder them? (for new readers, the Greyhound racing industry tears the ears off of the former racers before they dump them in mass graves, which may be by the roadside, because they have to remove the ears because of the identifying tattoos shown in clip number , above.). As has been seen recently, you may just cut the ears off Greyhound while still alive and dump it on the streets. There are clips of dead Greys who have had their ears torn off, as well, in the above clips, so don’t for a minute think you can call this fact a “lie”, or “propaganda”, and all the usual tactics you employ. As well, don't even think of saying these are coyotes or foxes, as some have tried before. Different noses, different heads, and different fur.